Englo wet dust extractors are installed at hundreds of mining and heavy industrial locations. The equipment package is rugged, compact and easy to maintain. Englo designs turnkey systems including system design, equipment supply, installation and field commissioning. Dust generated at process operations is captured with exhaust hoods and conveyed through ductwork to the Englo inlet flange. An optional pre-filter inlet box is often used at the inlet to capture about 80% of the incoming dust. Water is injected into the incoming air to capture and remove the coarser dust particulate. Dirty water and captured dust gravity discharges continuously through a drain line where it normally connects into the main effluent drain piping. Three Englo Type 36 dust extractors connect into a common pre-filter inlet box to extract coal dust generated at a tandem dumper rail car unloading operation. This coal terminal receives PRB coal by train, stores the coal then reloads it to barges for transport to coal power plants. This Englo Type 33 dust extractor is ventilating dust from a coal reclaim tunnel at a power plant. Dust generated at coal feeders is captured at exhaust hoods and transported to the surface through ductwork connected to the extractor inlet. Englo dust extractors operate with 99.7% removal efficiency based on independent testing on PRB coal dust. Each dust extractor has an integral axial impellor turbofan that produces the air volume and static pressure required for the exhaust hoods and ductwork system. Water is injected at the impellor inlet where it is spun with high energy to capture extremely fine particulate. Dirty water is captured with knitmesh panels and discharged to a bottom sump. Dirty effluent drains continuously to a plant drainage system or to a water recirculation filter system. Louvered demister panels capture any overspray from the mesh panels and clean air exits the extractor through an exhaust elbow and silencer stack. Water is continuously sprayed into the Englo impellor with coarse orifice nozzles designed to prevent plugging. Continuously wetted knitmesh panels flush dirty water to a drain sump at the bottom of the extractor. Dirty water flushes out of the sump to the plant drain system or to a water recirculation unit. Englo dust extractors include a motor, impellor, knitmesh extraction panels, louver demister panels, water spray headers, water management controls package and electrical controls package. Individual units may include components that are customized for a specific application. Englo can also design and supply special ventilation equipment such as auxiliary ventilation fans for underground mining and custom packages for tunneling applications. Extractor capacity ranges from 1400 SCFM to over 50,000 SCFM with single units. Additional volume is achieved by installing multiple units in parallel. Englo engineers custom design process ventilation systems that deliver exceptional performance combined with simple operation and maintenance, compact and robust equipment, small footprint, lower capital and O&M costs and no filter bags to maintain. Mining installations are operating at gold, silver, limestone, gypsum, potash, phosphate, coal, and other sites. The largest application of Englo technology has been for handling combustible coal dust at power companies and mines. These installations include systems for conveyor transfers, tripper rooms, crusher buildings, and reclaim tunnels. Additional systems operate at reclaim sites for metal and rubber recycling. 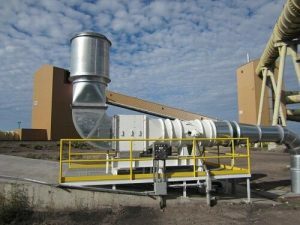 Englo systems operate in difficult conditions where combustible dust, moisture, or high temperature create problems for dry dust collection systems such as fabric filter or cartridge collectors.